While those that love summer aren’t enjoying the darkness that winter brings, I always see it as an opportunity for cosy nights-in, self-love days and mini pamper seshs! The temperature might be low, and the urge to sleep might be high, but I think this season is the perfect time to treaty yo’self, in the words of Tom Haverford (Parks & Rec, you feel me). Here are my favourite products I can’t live without when I’m taking time for myself. While I’m super excited and buzzing with ideas for my makeup-themed months next year, the ones I’ve planned for December have hit my skin hard. Doing 3-4 looks a day, I’ve really been putting my skin under strain, especially through the removal and re-application of cosmetics; it’s really left my skin raw and starved of good oils it needs. 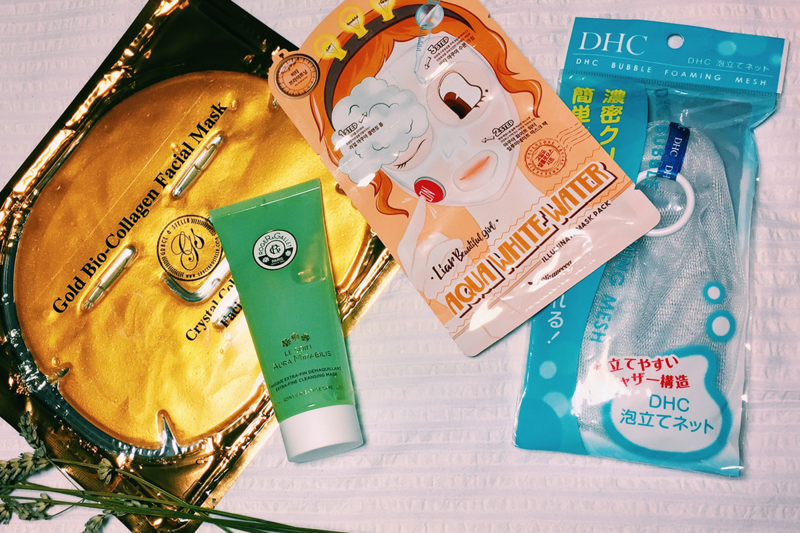 I’ve been so impressed with Korean and Japanese beauty of late, and DHC’s bubble foaming mesh is a firm favourite. You simply add your favourite cleanser, and this little device makes the most of what you have by transforming your cleanser into a frothy, bubbling foam. I’m also a big fan of Korean skincare and I’ve been picking up these 3-step masks in TK Maxx of late- they’re good to use once every couple of weeks for a face refresh. Grace and Stella are a brand I found on Amazon a little while ago, and I’ve tried a few of their products but the gold collagen mask is by far my favourite- The peel on and off factor is an ideal alternative to traditional mudmasks, and it really leaves my face feeling refreshed. Did I mention it’s also perfect for hilarious selfies?! How can I possibly put my love of Roger and Gallet into words? Their luxurious cleanser can also be used as a mask and after days of abusing my skin with makeup looks, it’s an amazing pick-me-up. To quote the brand, this lush mixture contains “all the natural powers of 18 officinal plants combined with extra fine Helianthus flower oil, rich in essential fatty acids.” Sounds so good, doesn’t it? 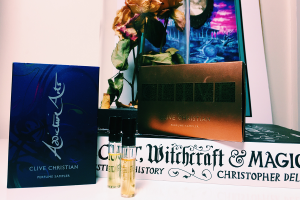 I’m all about those sweet smells, and nothing says ‘treat yo’self’ quite like a new perfume. It’s always a good call, especially as your current perfumes can become a little invisible to your nose after a while. 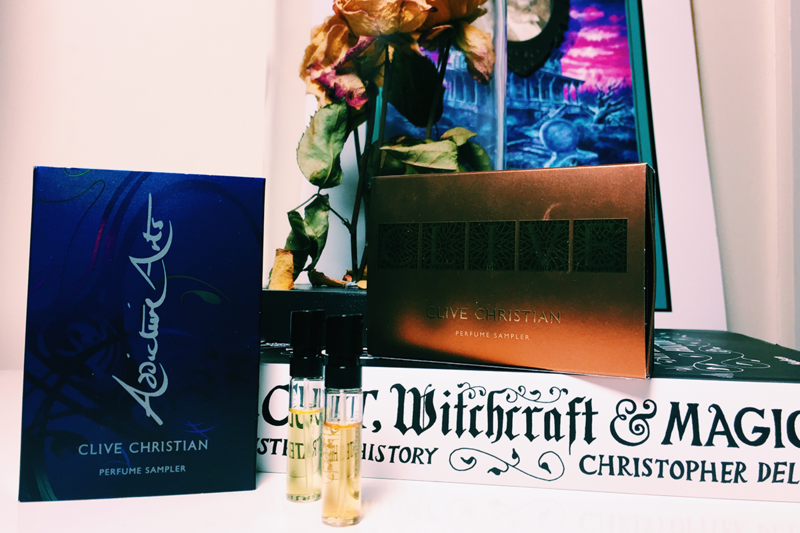 On the lookout for a brand new scent, I discovered Clive Christian’s Addictive Arts perfume and my god! The scent is so rich and so dark, it’s ideal for those who want an intense scent that lasts all day. Despite my wig-wearing to give my hair a little rest, I have to admit the bleaching has really had a negative effect on my hair. I’m so concious not to make my alrady delicate locks any worse, so I’ve been really treating it with some fab products. To rejuvenate my locks, I reach for Olaplex no3, a bond-builder that’s designed to give you salon results from home. It’s an amazing more-than-conditioner product that I honestly couldn’t live without! 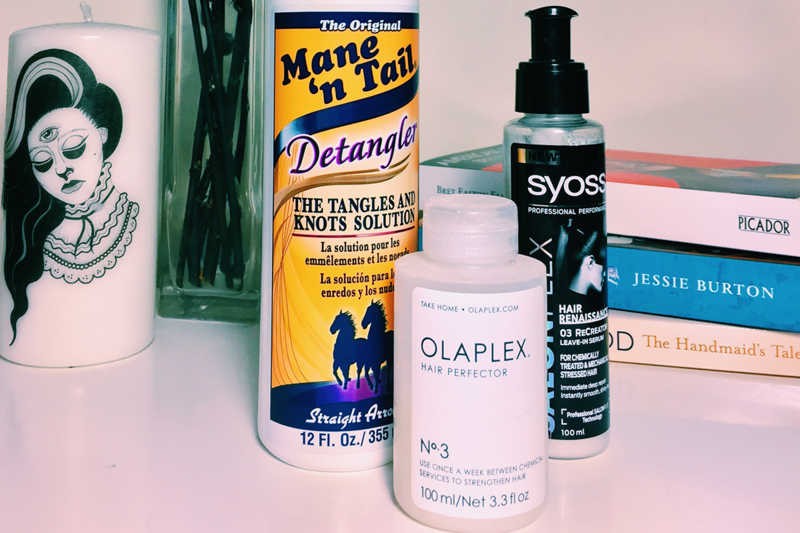 For those days when my hair is super frizzy and a little tangled, Mane ‘ n Tails’ Detangler is ah-mazing. It sprays on for super easy application, and smells DIVINE. Lastly, for a little maintainance in between washes, I reach for Syoss’s Salonplex leave-in serum, which basically has the same purpose of re-enforcing bonds in the hair. While I don’t rate it as highly as Olaplex, it’s a perfect re-inforcer from time to time. Taking Care of My… Make Up Bag? Haha okay I’m totally clutching at straws here, but I’m trying to justify the enormous amount of makeup I just bought in the Black Friday sales.. (oops). But on the positive side, buying new products means I can chuck old/out of date ones away, as I quite rightly should. Here are a few highlights of my splurge! Barry M’s Crown Jewels palette is lush, and a perf dupe of ABH’s subculture palette, some travel-size Lottie London brushes (because everything is cuter when it’s smaller), Sugar Pill’s lip colour in collaboration with Kim Chi (I DIE OVER THIS) and Jeffree Star’s Masochist lip colour-consider my JS cherry popped. How do you like to treat yo’self? Something I’ve only learnt recently is how important to take time out and pamper yourself! I’ve always wanted to try Olaplex, too! Defo Kirsty, couldnt agree more! Yes gal you picked some fab products! I was so impressed with how long lasting that perfume is! I absolutely adore taking a moment to just sit and pamper myself, especially as the colder weather rolls in and I get a lot busier with life it’s important to take some time for myself. Pamper day is such an important thing, we all need to make time for it regularly. 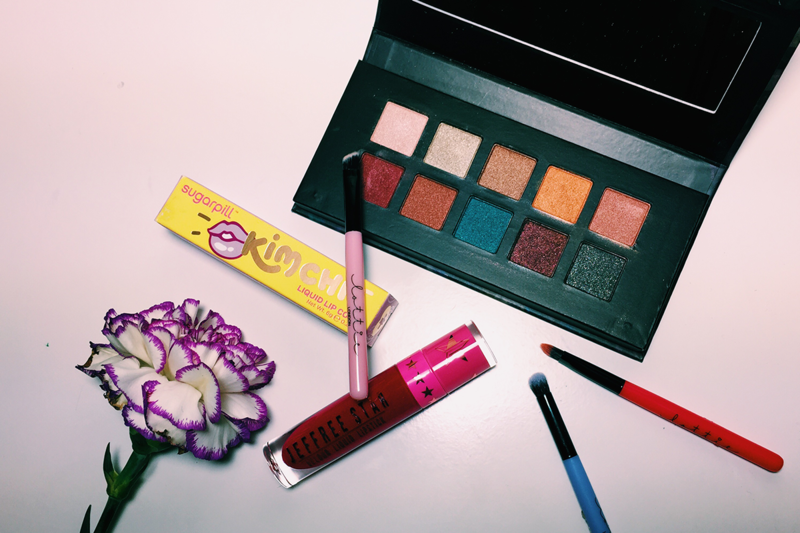 That palette you included in your picture is gorgeous – loving the colours! Thanks so much Britt! Couldn’t agree more! Its so good! I totally recommend it Terri!